2 weeks ago I almost did the unthinkable, hit a cyclist while driving a car! It was dark, in a badly lit neighborhood, I was turning right after a mandatory stop and out of nowhere a guy on a single speed passed me on my right. Thankfully I hit the brakes pretty fast and the rider was in no danger. The one vital element that was missing on that bike was any kind of lighting device. One tiny blinking white $3 LED would have avoided this brush with disaster and any other future mishap in the making for that youthful, yet foolish, rider. That little blinky is also a great way to prevent another bad ailment, death. In this day and age I am just fraking amazed that people are still riding at night with no lights at all. I mean gone are the days of the 2 day battery life light or energy robbing dynamo. We do have 21st Century solutions for seeing or being seen in the dark and some are cheap too! 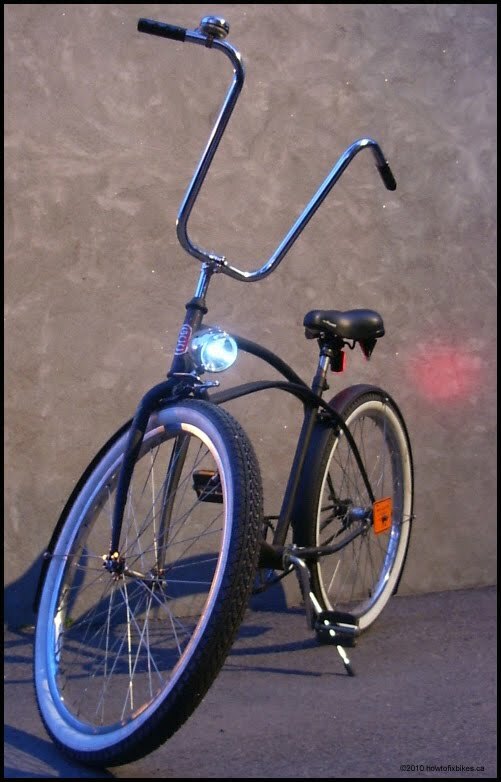 I hear some of you saying, "yeah but I have reflectors on my bike". 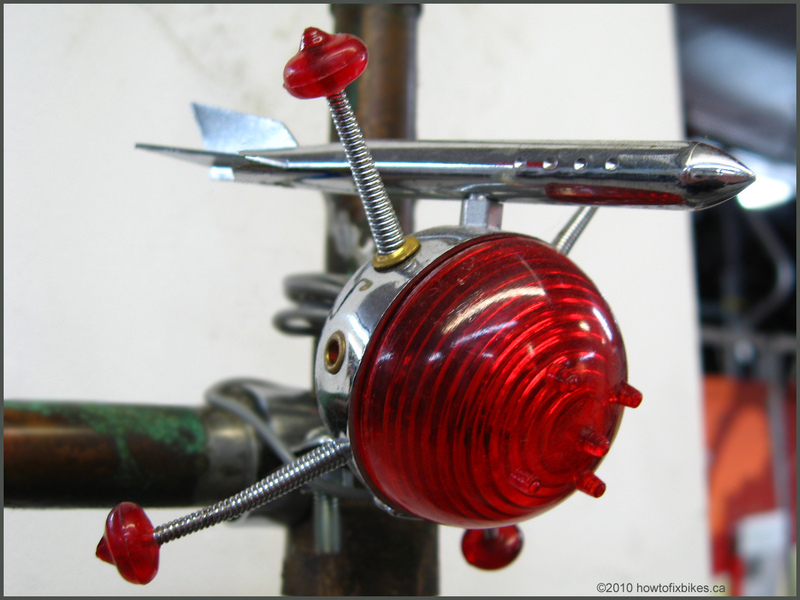 Reflectors only work when light is directly aimed at them, "reflecting" said light, and won't do anything for you to tell the driving kind that you are on the road from multiple angles. You have to determine what you need. You want to be seen or you want to see is one factor to consider when you start shopping. If you live in the city and most streets are well lit, you want to be seen. In this case you can get yourself a white LED blinker for the front and a red LED blinker for the back of your bike. Blinking lights grab attention and that's what you want in an urban setting full of distractions. These range anywhere between $3 to $25. Over $10 I think you are paying too much. You can also think outside the box and go shop elsewhere for blinking LED's. 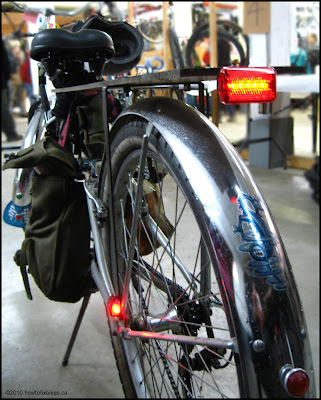 The bike pictured in this post had it's vintage headlight refit with a $1 book reading LED light from the dollar store. Now if you want to see, this will be a bit more expensive but if you are handy this too could be a lot cheaper. I've bought light "pucks" with a dozen white LED's powered by 3 AAA cells for less than $5. That unit would be easily adapted to a set of handlebars. If not, your local bike shop carries a full range of options. I would stick with LED's since their power consumption is very low. Remember to change your batteries once a season. Don't wait for your lights to dim, spend a few bucks each Spring. On a final note, for riding at night more lights is always better than not enough. So if you want to put more than the basic, go right ahead. Money spent on basic safety is an investment in yourself. Glad you managed to avoid that accident. I am also amazed at the people who ride in the dark without lights. Beyond the lighting though - why was the bicyclist passing to the right of a right turning vehicle? My question as well since I was using my turn signal to show my intention. where did you find that awesome light that looks like a rocket? It was hanging at the Cyclo nord/sud community bike shop. It's the first time I've seen one like this. If it was mine, it would be somewhere on my bike for sure!